If you have written your food safety plan and are preparing for a third party audit, the Rutgers On-Farm Food Safety Team offers farm “walk-throughs” to help evaluate your written plan and compliance activities. Over many years of performing walk-throughs, we’ve found some common situations that can foil the goal of making it through the audit process on the first go-round. Take a moment to make sure you’ve handled these areas that have tripped-up fellow NJ growers. If a grower hires someone to write his or her food safety manual, the grower must know what is in the manual and adhere to the contents! There have been instances when the auditors came to do the audit, that it was obvious the grower did not know what was in their own farm food safety manual. Sit down with the person developing the manual to make sure there is agreement about what to put in the manual. Once the manual has been developed, review each section to clarify and make necessary changes for the final version. 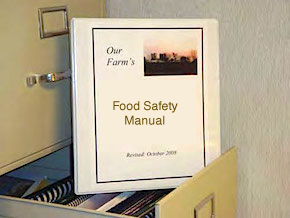 Remember, auditors use the grower’s food safety manual as the basis for the audit. If the grower does not know and understand the contents of their manual, they won’t be able to answer the auditors’ questions. Have an On-Farm Food Safety question concerning your commercial NJ farm? Email us.